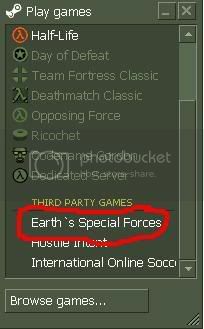 Hello, I am new to this forums and to Esf..
but I got a prob installing the game to steam.. I downloaded and Installed steam, created an account and everything.. but now I got stuck.. cus I want to install half life (that I already own on disc that I bought year ago) and I don't know where to install it and what to do.. can any1 plz help me? I heard that I need to something with [email protected] folder.. and install it there.. but I can't find this folder..
Welcome,and you have to right click where it says Half Life in Play Games in the steam menu :O! you don't understand.. I don't got this at my "play games" menu.. I didn't install half life yet.. cus I don't know where.. now how I create my folder? You sort of did it backward. 2. Install Half-life. It will install itself. "C:\Program Files\Valve\Steam"
3. Install steam. "C:\Program Files\Valve\Steam" that's where it will install. 4. install esf 1.2 and it has a choice won or steam. pick steam. 5. 1.2.1 if you want it. there is prolly 1 or 2 servers that are 1.2. if this doesnt help you IM me. I got a prob.. you say I need to install half life to ..program files\Valve\Steam, so I put it in an when I try to click next I get a message saying: "Setup requires this product to be installed under a \SIERRA\Half-Life subdirectroy. Setup has changed the directory to reflect this requirement"..
so I need to do it ..program files\Valve\Steam\SIERRA\Half-Life? btw thx for trying to help..
no no no no no... ug look! get rid of anything related to half life steam or esf. 2. install STEAM it will know where to intall. No, don't install Half Life from the CD. The ONLY thing you need to play Half Life through Steam is a working non-pirated CD-Key. Once you have Steam, you download Half Life through the Steam servers. After you have ran Half Life through Steam at least once, you THEN install ESF 1.2 then the 1.2.1 patch. And then you will see it on your 3rd party games list. Also, if you have not done so, register your Half Life cd key by clicking on Register Product I Already Own under the 'Browse Games' section of Steam.